I love my Galaxy S Android Phone's Battery Life! At Technoracle, we regularly test out devices for long term reliability, performance, and durability. Mobile devices often vary dramatically from the manufacturer's claims and real world tests reveal the true nature of a specific device. 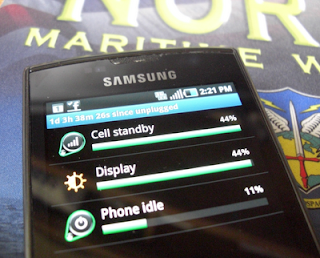 For example, some smartphones have claimed 4-day standby time. No device I have ever used has ever met such a claim while we were using it. Most users we know are happy to get 24 hrs out of their devices with real world uses. Four days of use from a single charge might be possible if you disabled all functions other than sitting idle and left the phone in a cool room with no magnetic interference. For most users, add in email account monitoring, some web browsing, navigation and a few calls and the time goes down significantly. The major reason I went from iOS to Android is that I hated the idea of someone sealing my battery into the phone. I want two batteries and the ability to swap them out as they get tired. Nevertheless, the Samsung Galaxy S has amazed. 1. Reduce screen brightness. Do this manually. The auto-detection itself uses energy when woken up. 2. Configure email not to push automatically or synch. Do this manually. What point is there for you to have email pushed to you that you will not read? Wait until you want it, then fetch it. 3. Disable GPS when not in use. 4. Disable Bluetooth when not using. 5. Regularly check the application and memory manager and clean out programs that you are not actively using. 6. Disable notifications from applications (Twitter, Facebook, news, weather, etc.) that you do not need. When I go on my boat, I do require that severe weather be pushed to me. 7. Disable auto-orientation. The listener that detects position changes runs the accelerometer, a piece of hardware that consumes battery life. Luckily the feature can be disabled from the pull down menu.